Paco Wong (黃柏高) may have just inadvertently revealed that Nicky Wu (吳奇隆) and Cecilia Liu (劉詩詩) are expecting. Maybe that’s why Nicky’s been sporting a dad bod! It’s been three years since the Scarlet Heart <步步驚心> lovers have tied the knot, and although both husband and wife have expressed wishes of wanting children, but that wish never came to fruition. A gossip source recently leaked that Cecilia may be expecting twins, although the couple themselves never confirmed whether the rumor was true or not. 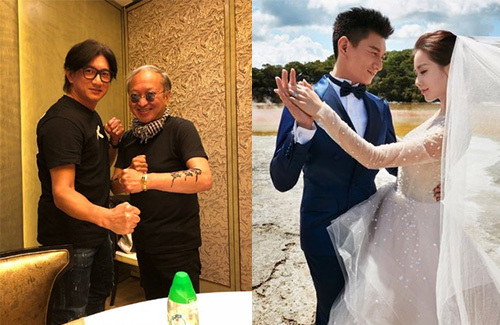 But a confirmation by the couple doesn’t seem to be necessary, as influential Hong Kong producer Paco Wong may have just dropped the big hint. In the picture Paco shared, it appears that Nicky have gained a great deal of weight—maybe to prepare for the upcoming year as a new father?